To what is the Kingdom of Heaven similar? It is similar to a berry of mustard. A man took it and placed it in his field and it grew and became a tree. And the birds of heaven roosted in its branches. To starter dough, which a woman took and hid in three seahs of meal, until it all was leavened. In Luke’s Gospel the Mustard Seed and Starter Dough parables (Luke 13:18-21) are tied to the Healing a Daughter of Abraham story (Luke 13:10-17). Since the parables are not particularly illustrative of the situation described in that story, we deem their placement in Luke to be secondary. Probably the author of Luke found the Mustard Seed and Starter Dough parables without a narrative context in the Anthology (Anth. ), and the secondary connection to the Healing a Daughter of Abraham story was the author of Luke’s failed attempt to find a suitable location in which to present them. The author of Mark may have relocated the Mustard Seed and Starter Dough parables because he perceived their weak connection to their narrative context in Luke. It is also possible that the author of Mark found the Mustard Seed parable associated with other agricultural parables in his second source, Anth. In any case, the author of Mark took the Mustard Seed parable and added it to his excursus on parables in the fourth chapter of his Gospel (Mark 4:1-34). Luke’s treatment of the Four Soils parable inspired the author of Mark to create his parables excursus. As we have discussed elsewhere, the author of Luke injected the Mysteries of the Kingdom of Heaven saying into the discussion of the Four Soils parable, thereby transforming Mysteries of the Kingdom of Heaven into a rationale for Jesus’ use of story parables when teaching in public. Following the Four Soils interpretation the author of Luke added a string of sayings (Luke 8:16-18) from the First Reconstruction (FR) about revelation and listening. The author of Mark, building upon this foundation, added a few more sayings (Mark 4:23-24) parallel to the FR collection in Luke, and proceeded to insert the Spontaneous Growth parable (Mark 4:26-29) and the Mustard Seed parable (Mark 4:30-32). Finally, the author of Mark provided a summary statement explaining that Jesus never spoke to the crowds except in parables, while to disciples Jesus gave clearer explanations (Mark 4:33-34). It is likely that the author of Mark omitted the Starter Dough parable because it did not include the imagery of seeds and sowing and growth, which characterize the other parables in his parables excursus. The author of Matthew expanded the Markan excursus on parables into the third major discourse of his Gospel (Matt. 13:1-53). From Mark the author of Matthew adopted the order of the Four Soils parable followed by Mysteries of the Kingdom of Heaven, into which he inserted the Whoever Has Will Be Given More saying (Matt. 13:12). Following his version of Mysteries of the Kingdom of Heaven, the author of Matthew added the Blessedness of the Twelve pronouncement, probably because he found Blessedness of the Twelve joined to Mysteries of the Kingdom of Heaven in Anth. Returning to Mark’s order, the author of Matthew gave the Four Soils interpretation, then he skipped over the materials in Mark 4:21-25 (parallel to the FR collection of sayings in Luke 8:16-18), probably because he had already included their Anth. 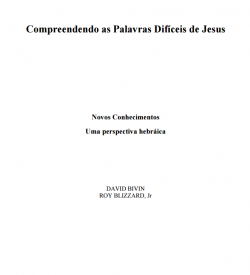 versions in the Sermon on the Mount or the Sending the Twelve discourse. The author of Matthew then substituted Mark’s Spontaneous Growth parable with the Darnel Among the Wheat parable (Matt. 13:24-30), but that he was still tracking Mark is shown by their common placement of the Mustard Seed parable (Matt. 13:31-32) followed by a summary statement declaring that Jesus spoke to the crowds only in parables (Matt. 13:34-35). Between these the author of Matthew inserted the Starter Dough parable (Matt. 13:33), undoubtedly because he saw these two paired together in Anth. Following the summary statement adapted from Mark, the author of Matthew gave an interpretation of the Darnel Among the Wheat parable (Matt. 13:36-43) and added three more parables: Hidden Treasure and Priceless Pearl (Matt. 13:44-46) and Bad Fish Among the Good (Matt. 13:47-50). These additions gave Matthew’s third discourse a total of seven parables, a number that he probably achieved intentionally. Finally, the author of Matthew added the Trained Scribe saying (Matt. 13:51-52), and then composed a conclusion to the discourse (Matt. 13:53). The Anthologizer’s rearrangement of the “Yohanan the Immerser and the Kingdom of Heaven” complex. Having established that the position of the Mustard Seed and Starter Dough parables is probably secondary in all three Synoptic Gospels and that these parables likely lacked a narrative context in Anth., it is necessary for us to consider what the original context of the parables in the Hebrew biography of Jesus may have been. Lindsey believed that in the Hebrew Life of Yeshua parables occurred as illustrations of teachings given in response to specific situations. Lindsey also maintained that it is sometimes possible to restore parables to their original teaching complex, either by identifying special vocabulary that appeared in a teaching as well as in a parable, or by demonstrating that a parable illustrated a concept in a teaching that might have been challenging to the audience or difficult for them to understand. Regarding the Mustard Seed and Starter Dough parables, Lindsey believed that these twin parables were particularly apt illustrations of Jesus’ saying that “the Kingdom of Heaven is increasing, and breakers-through are increasing within it” (translation based on our Hebrew reconstruction). What may have been shocking to Jesus’ listeners about this saying was the implication that the Kingdom of Heaven had a starting point, and that human beings could contribute to the Kingdom of Heaven’s increase by following Jesus’ teachings and encouraging others to do the same. According to Flusser, the rabbinic sages viewed the Kingdom of Heaven as suprahistorical—the Kingdom of Heaven had always been and would always remain —and as such they understood the Kingdom of Heaven as static, or unchanging. Jesus, on the other hand, viewed the Kingdom of Heaven as dynamic. Jesus conceived of the Kingdom of Heaven as a divine activity, a breaking in of God’s redeeming power into the world of human affairs. Since Jesus believed that this divine activity had a definite starting point in history (most likely at the moment of Jesus’ baptism when the heavens were opened and God’s spirit came upon him), Jesus could also speak of the Kingdom of Heaven as a period within history, a period characterized by God’s redeeming of Israel, humankind and his entire creation. 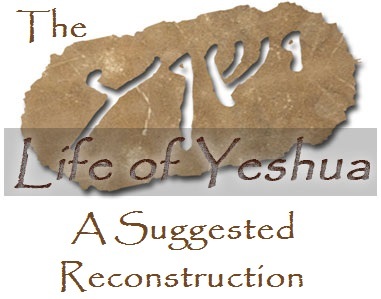 The reconstructed “Yohanan the Immerser and the Kingdom of Heaven” complex as it appeared in the Hebrew Life of Yeshua. Moreover, Jesus spoke of the Kingdom of Heaven as expanding. Whenever the sick were healed of illnesses, whenever possessed persons were liberated from demonic influence, whenever debts were canceled in imitation of divine forbearance, whenever peace was made between hostile factions, the Kingdom of Heaven increased. Likewise, Jesus could describe the Kingdom of Heaven in terms of the community of persons who participated with God in his redeeming activity. As more people were attracted to Jesus’ teachings and practices and adopted them, the Kingdom of Heaven grew. These new and surprising uses of the concept of the Kingdom of Heaven demanded explanation and illustration. For this purpose Jesus chose the images of a mustard seed that a person plants in the ground, which becomes a flourishing tree, and of a starter dough that a woman kneads into flour, which rises into loaves ready to be baked in the oven. Jesus used these scenarios to demonstrate that the Kingdom of Heaven, too, is a living and active presence that was increasing within the sphere of human interactions. Perhaps the parables also illustrate how human beings and God can participate together in a single activity, for while human beings might plant a seed or mix a batch of dough, the life within them that causes them to grow is from God. Click here for an overview of the entire “Yohanan the Immerser and the Kingdom of Heaven” complex. We suspect that the author of Luke copied the Mustard Seed and Starter Dough parables from his Hebraic-Greek source, the Anthology (Anth.). Although there are a few signs of redaction in the Lukan versions of these parables (on which, see the Comment section below), the near perfect verbal agreement between the Lukan and Matthean versions of the Starter Dough parable suggests that both versions were copied from the same source. Therefore, the limited editorial activity in Luke’s version of these twin parables should be attributed to the author of Luke rather than to the First Reconstructor (the creator of Luke’s second source, FR). Mark’s version of the Mustard Seed parable (Mark 4:30-32) is a thoroughgoing paraphrase and dramatization of Luke 13:18-19. Matthew’s version of the Mustard Seed parable (Matt. 13:31-32), with its numerous minor agreements with Luke, is a blend of the versions the author of Matthew found in Anth. and Mark. Since Mark omitted the Starter Dough parable, Matthew’s version comes only from Anth. Versions of the Mustard Seed and Starter Dough parables are also found in the Gospel of Thomas, where, however, they are not conjoined as in Luke and Matthew. Was planting mustard in a garden a violation of Jewish law? Is the impurity of the Kingdom of Heaven a dominant theme in the Mustard Seed and Starter Dough parables, as some recent interpreters suggest? Seeds of the black mustard plant. Image courtesy of Joshua N. Tilton. L1-2 ἄλλην παραβολὴν παρέθηκεν αὐτοῖς (Matt. 13:31). The phrase ἄλλη παραβολή (allē parabolē, “another parable”) is unique to the Gospel of Matthew. Matthew is also the only Gospel to use the verb παρατιθέναι (paratithenai, “to set before”) with reference to parables. This the author of Matthew did twice in the parable discourse (Matt. 13:24, 31). These observations lead us to the conclusion that Matthew’s introduction to the Mustard Seed parable is redactional. L3 ἔλεγεν οὖν (Luke 13:18). Luke’s use of the imperfect form ἔλεγεν (elegen, “he was saying”) is not particularly Hebraic, but sometimes the author of Luke adopted this form to avoid the monotonous use of the aorist εἶπεν (eipen, “he said”) in his source. The conjunction οὖν (oun, “therefore”) was used to link the Mustard Seed and Starter Dough parables to the preceding Healing a Daughter of Abraham narrative. We therefore regard Luke’s wording in L3 to be redactional. καὶ ἔλεγεν (Mark 4:30). Lindsey noted the exaggerated use of the third person imperfect forms ἔλεγεν/ἔλεγον in Mark, a phenomenon he referred to as a “Markan stereotype.” Mark and Luke agree to use ἔλεγεν (“he was saying”) only in the Lord of Shabbat story (Mark 2:27 // Luke 6:5) and in the Mustard Seed parable (Mark 4:30 // Luke 13:18). According to Lindsey, the first instance of a stereotype in Mark often reveals the location from which the author of Mark picked up his stereotypical phrase in Luke’s writings. Thereafter, the author of Mark typically avoided using his stereotypical words and phrases in the places where they appear in Luke, so it is somewhat surprising that the author of Mark wrote καὶ ἔλεγεν (“and he was saying”) opposite Luke’s ἔλεγεν οὖν (“he was saying, therefore”) in the Mustard Seed parable. This deviation in Mark’s practice may be explained by the particularly high concentration of ἔλεγεν in Mark chapter 4, where it occurs 7xx (Mark 4:2, 9, 11, 21, 24, 26, 30). Having introduced the other two parables with καὶ ἔλεγεν in his parables excursus (Mark 4:2, 26), the author of Mark decided to do the same in his third and final parable of the collection. εἶπεν δὲ πρὸς αὐτοὺς παραβολὴν λέγων (GR). Having concluded that the introductions to the Mustard Seed parable in Luke, Mark and Matthew are redactional, we are left to imagine how the introduction to the parable may have been worded at a pre-synoptic stage of transmission. Elsewhere we have found that Luke preserves introductions to parables and similes with the combination λέγειν + παραβολή (“to tell [lit., say]” + “a parable”), such as εἶπεν δὲ πρὸς αὐτοὺς τὴν παραβολὴν ταύτην λέγων (“and he said to them this parable, saying”; Luke 15:3), which reverts easily to Hebrew as וַיִּמְשׁוֹל לָהֶם אֶת הַמָּשָׁל הַזֶּה לֵאמֹר (“and he parabled to them this parable, saying”). Perhaps this, or a similar phrase, was used to introduce the Mustard Seed and Starter Dough parables in the Hebrew Life of Yeshua. It is possible that the introduction was entirely removed by the Anthologizer when he separated the Mustard Seed and Starter Dough parables from their narrative context, but Matthew’s λέγων (“saying”) in Matt. 13:31 (L3) and Mark’s παραβολῇ (“[in] a parable”) in Mark 4:30 (L6) hint that an introduction such as the one we have proposed for GR still existed in Anth. In that case, it was the author of Luke who pared down the introduction in his source to ἔλεγεν οὖν in Luke 13:18 (L3). L4-6 In Luke and Mark the Mustard Seed parable begins with a double question. Matthew’s version omits this feature of the parable. Noting that parables in rabbinic sources frequently open with a question, many scholars suspect that the parable originally did include a double question, and that the omission in Matthew is due to Matthean abbreviation of his source. Fleddermann argued that Mark’s double questions are a reworked version of the questions in the pre-synoptic source that stands behind Luke 13:18. Instead of a third person singular verb in the first question and a first person singular verb in the second question, as in Luke 13:18 (ἐστίν, L4; ὁμοιώσω, L6), the author of Mark streamlined the wording with a first person plural verb in each of the questions (ὁμοιώσωμεν, L4; θῶμεν, L6). Fleddermann also notes that Mark’s question (“In what parable can we put it?”) is more explicit than Luke’s question (“To what will I compare it?”). Mark’s questions also have a chiastic structure, with the verb in the first question appearing at the beginning of the sentence and the verb in the second question appearing at the end. The chiastic form might also be a sign of secondary development. In addition to these observations, it must be noted that Mark’s versions of the questions are un-Hebraic, both in terms of the subjunctive mood of the verbs in both questions and with respect to the word order of the second question. The un-Hebraic nature of Mark’s second question is demonstrated by the difficulty Hebrew translators have in putting it into Hebrew. Delitzsch’s translation rendered ἢ ἐν τίνι αὐτὴν παραβολῇ θῶμεν (“Or in what parable might we put it?”) as וּבְאֵי זֶה מָשָׁל נַמְשִׁילֶנָּה (“And in which parable will we cause it to be parabled?”), while MHNT reads אוֹ בְּאֵיזֶה מָשָׁל נַמְשִׁיל אוֹתָהּ (“Or in which parable will we cause it to be parabled?”). Neither is a particularly literal translation. The Lukan forms of the questions, by contrast, revert quite nicely to Hebrew, as we will discuss in further detail below. But what connection the Mustard Seed parable might have to this verse is unclear, and since Jesus elsewhere began comparisons with double questions (cf., e.g., Luke 7:31), and since beginning parables with questions is typical of rabbinic literature, the supposed allusion to Isa. 40:18 seems unnecessarily subtle. These two examples, despite coming from late rabbinic sources, provide exact grammatical parallels to our Hebrew reconstruction in L4-5. L5 ἡ βασιλεία τῶν οὐρανῶν (GR). Whereas Luke and Mark have “Kingdom of God,” we have adopted “Kingdom of Heaven” for GR, since it was the author of Luke’s practice to replace the Hebraic phrase ἡ βασιλεία τῶν οὐρανῶν with ἡ βασιλεία τοῦ θεοῦ whenever he encountered the former in his sources. Despite being displaced from its original location in L5 due to the author of Matthew’s decision to eliminate the introductory questions, Anth.’s wording is preserved in L8 of Matthew’s version of the Mustard Seed parable. מַלְכוּת שָׁמַיִם (HR). On reconstructing the phrase ἡ βασιλεία τῶν οὐρανῶν (hē basileia tōn ouranōn, “the Kingdom of Heaven”) as מַלְכוּת שָׁמַיִם (malchūt shāmayim, “the Kingdom of Heaven”), see Not Everyone Can Be Yeshua’s Disciple, Comment to L39. L6 ἢ ἐν τίνι αὐτὴν παραβολῇ θῶμεν (Mark 4:30). A textual variant in Codex Bezae reads ἐν ποίᾳ παραβολῇ παραβάλωμεν αὐτήν (“In what kind of parable will we parable it?”). While Bezae’s reading resembles the Hebrew phrase מָשַׁל מָשָׁל (“parable a parable”), overall the textual variant appears to be a stylistic improvement to Mark’s awkward Greek. καὶ τίνι ὁμοιώσω αὐτήν (GR). Above in Comment to L4-6 we discussed the un-Hebraic quality of Mark’s wording in L6. Young, expressing doubt whether Luke’s wording in L6 is original, suggested that the second question may have been formulated by the author of Luke. But in the DT pericope “Like Children Playing” Matthew and Luke agree on the phrase τίνι ὁμοιώσω (“To what will I compare?”; Matt. 11:16 // Luke 7:31), which gives us solid evidence that this phrase appeared in at least one Anth. pericope. Since Luke’s version of the Mustard Seed parable is also an Anth. pericope, it is likely that the author of Luke copied τίνι ὁμοιώσω in L6 from Anth. Such examples support our reconstruction of Luke’s question in L6. L7 ὡς (Mark 4:31). Mark’s construction ὡς κόκκῳ σινάπεως (“as to a seed of mustard”) is a bit odd, since following the verb τιθέναι we would ordinarily expect an accusative. Mark’s dative (“to a seed”) appears to be responding to the verb ὁμοιοῦν, and Swete suggested that with his unusual construction the author of Mark was attempting to answer both questions at once. The phrase “like a seed of mustard” occurs in just one other context in the Gospels, in a verse that Luke and Matthew agree to include in the Boy Delivered from Demon pericope, but which is omitted in the parallel in Mark: “If you have faith like a seed of mustard [ὡς κόκκον σινάπεως]…” (Matt. 17:20 // Luke 17:6). According to Lindsey, it was the author of Mark’s practice to lift words and phrases from portions of Luke that he omitted and to reinsert them at other points in his Gospel. Given this editorial quirk, it is possible that the author of Mark remembered ὡς κόκκον σινάπεως in Luke 17:6, and therefore used ὡς in L7 to replace Luke’s ὁμοία ἐστίν when he paraphrased Luke 13:19. However, it is also possible that the apparent pick-up is merely a coincidence, since the author of Mark always avoided using the adjective ὅμοιος (homoios, “like”), but he used ὡς (hōs, “as”) to introduce the immediately preceding Spontaneous Growth parable (Mark 4:26) and also to introduce his condensed version of the Talents parable (Mark 13:34). Or it is possible that both factors were at play when the author of Mark wrote ὡς κόκκῳ σινάπεως in place of Luke’s ὁμοία ἐστὶν κόκκῳ σινάπεως. ὁμοία ἐστὶν (GR). The Lukan-Matthean agreement against Mark to write ὁμοία ἐστίν (“it is like”) virtually guarantees that this was the reading of Anth. Nevertheless, we have not provided a Hebrew reconstruction for L7 since in the introductions to rabbinic parables we never find a sentence beginning with דּוֹמֶה (dōmeh, “[it is] like”) following an opening question. We suspect that the Greek translator of the Hebrew Life of Yeshua supplied the phrase ὁμοία ἐστίν because he did not like to answer the question with an incomplete sentence, in this case with the dative phrase κόκκῳ σινάπεως (“to a seed of mustard”). L8 ἡ βασιλεία τῶν οὐρανῶν (Matt. 13:31). The combination ὁμοία ἐστὶν ἡ βασιλεία (“like is the kingdom”) is nearly exclusive to Matthew’s parable discourse (Matt. 13:31, 33, 44, 45, 47), the one exception being Luke 13:18 (L4-5). In contradistinction to all of the Matthean instances, however, the sole occurrence of ὁμοία ἐστὶν ἡ βασιλεία in Luke is part of a question, whereas all the examples of ὁμοία ἐστὶν ἡ βασιλεία in Matthew are found at the beginning of declarative sentences. Similarly, the use of ὁμοιοῦν + ἡ βασιλεία is almost unique to the Gospel of Matthew (Matt. 13:24; 18:23; 22:2; 25:1), the only exceptions being found in the Markan introduction to the Mustard Seed parable (Mark 4:30; cf. Luke 13:18, ὁμοιώσω αὐτήν, where the antecedent of αὐτήν is ἡ βασιλεία τοῦ θεοῦ) and in the Lukan version of the Starter Dough parable (Luke 13:20). Once again, in contradistinction to all of the Matthean occurrences, which are declarative, the examples in Mark and Luke are interrogative. In addition, whereas the instances in Mark and Luke have active forms of ὁμοιοῦν, all of the Matthean examples of ὁμοιοῦν + ἡ βασιλεία have the verb in the passive voice. Since it was the author of Matthew who eliminated the introductory questions from the Mustard Seed parable (see above, Comment to L4-6) and, likewise, from the Starter Dough parable, we are forced to conclude that although Matthew’s vocabulary in L7-8 and in L29-30 was taken from Anth. (see above, Comment to L5), Matthew’s opening of the Mustard Seed and Starter Dough parables with the declarative “The Kingdom of Heaven is like…” is, in fact, redactional. This conclusion raises the possibility that the declarative openings of other parables in Matthew, whether with ὁμοία ἐστὶν ἡ βασιλεία or ὁμοιοῦν + ἡ βασιλεία, are also redactional. In some cases the author of Matthew may have simply transformed a question into a declarative statement. In other cases “The Kingdom of Heaven is like” and the less Hebraic “The Kingdom of Heaven may be likened” may simply be stereotyped Matthean introductions to parables that were not originally concerned with the Kingdom of Heaven at all. L9 κόκκῳ σινάπεως (GR). Here and in L22 are the only two places in the Mustard Seed parable where all three versions share exactly the same wording. The noun κόκκος (kokkos) can refer either to a seed or to the color red or purple. In NT κόκκος is used when referring to a single grain or kernel (cf., e.g., John 12:24; 1 Cor. 15:37). In the Synoptic Gospels κόκκος is used only in connection with the mustard seed. לְעֵין הַחַרְדָּל (HR). In LXX κόκκος occurs only twice (Sir. 45:10; Lam. 4:5), both times in reference not to a seed, but to a color. In the example from Lamentations κόκκος is the translation of תּוֹלָע (tōlā‘, “purple”). Thus, LXX usage is not helpful in our reconstruction. Neither is LXX of assistance in reconstructing the noun σίναπι (sinapi, “mustard plant”), since this term does not occur in LXX, nor is mustard ever mentioned in the Hebrew Bible. Black mustard (Brassica nigra), sometimes referred to as Sinapis nigra. Image courtesy of Wikimedia Commons. Rabbinic literature knows of a few varieties of mustard: חַרְדָּל (ḥardāl, “mustard”), חַרְדָּל מִצְרִי (ḥardāl mitzri, “Egyptian mustard”) and לַפְסָן (lafsān, “charlock” [a variety of wild mustard]). The first of these, which refers to black mustard (Brassica nigra), is probably that which is described in Jesus’ parable, since this is the variety which is commonly found in the Galilee and in the Jordan Valley. Reconstructing σίναπι as לַפְסָן is less attractive, not only because charlock is not usually cultivated, but also because לַפְסָן is a rabbinic loanword from the Greek term λαψάνη (lapsanē, “charlock”). Had לַפְסָן appeared in the Hebrew Life of Yeshua, we would have expected it to be translated with the Greek word from which it was derived. Young suggested reconstructing κόκκῳ σινάπεως in the Mustard Seed parable as גַּרְגַּר שֶׁל חַרְדָּל, but we have not followed his suggestion in HR. In the first place, the term גַּרְגַּר (gargar, “berry,” “grain”) never occurs in connection with חַרְדָּל in tannaic sources or in the Jerusalem or Babylonian Talmuds. In the second place, when the phrase ὡς κόκκον σινάπεως occurs in Matt. 17:20 // Luke 17:6 with reference to the quantity of a person’s faith, this corresponds precisely to the rabbinic phrase כְּעֵין הַחַרְדָּל (ke‘ēn haḥardāl, “like a grain [lit. ‘eye’] of the mustard plant”), which is used as a (very small) measure of quantity (cf., e.g., m. Toh. 8:8). Since עֵין הַחַרְדָּל is the reconstruction we must adopt for κόκκος σινάπεως in Matt. 17:20 // Luke 17:6, it would be strange to do otherwise in the Mustard Seed parable. In the land of Israel mustard was cultivated for its seeds and also for its leaves, which can be cooked as greens. Pliny the Elder (first century C.E.) also described numerous medicinal uses for which mustard was prized (Nat. Hist. 20:87 §231-233). According to Pliny, mustard seeds were known for germinating rapidly (Nat. Hist. 19:54 §170). L10 ὃν λαβὼν ἄνθρωπος (GR). Luke and Matthew agree against Mark in referring to a person who takes the mustard seed. Undoubtedly both authors drew this detail from Anth. The use of “take” + verb, as in Matt. 13:31 // Luke 13:19, is sometimes identified as a Hebraism. שֶׁנָּטַל אָדָם (HR). On reconstructing the relative pronoun ὅς (hos, “who,” “which”) with -שֶׁ (she-, “who,” “which”), see Hidden Treasure and Priceless Pearl, Comment to L5. In LXX most instances of λαμβάνειν (lambanein, “to take,” “to receive”) are the translation of לָקַח (lāqaḥ, “take”), and while this would be an acceptable option for HR, we have preferred to reconstruct λαμβάνειν with נָטַל (nāṭal, “take,” “pour”), mainly because of the examples in rabbinic sources (cited below, Comment to L32) of נָטַל used for “taking” starter dough. Since the same verb for “taking,” λαμβάνειν, occurs in both the Mustard Seed and Starter Dough parables, we prefer to use the same Hebrew reconstruction in L10 and L32. There are only four instances in MT of verbs from the נ-ט-ל root (2 Sam. 24:12; Isa. 40:15; 63:9; Lam. 3:28). In Isa. 63:9 a pi‘el form of נ-ט-ל was translated using the compound verb ἀναλαμβάνειν. Young also proposed using נָטַל to reconstruct λαμβάνειν in the Mustard Seed parable. On reconstructing ἄνθρωπος (anthrōpos, “person”) as אָדָם (’ādām, “person”), and on pairing אָדָם with אִשָּׁה in twin illustrations, see Lost Sheep and Lost Coin, Comment to L12. L11 ὅταν σπαρῇ ἐπὶ τῆς γῆς (Mark 4:31). There are indications that the author of Mark attempted to “homogenize” the vocabulary of the three agricultural parables (Four Soils, Spontaneous Growth, Mustard Seed) in the fourth chapter of his Gospel. We already observed examples of this phenomenon in Comment to L3, where we noted that the author of Mark introduced all three agricultural parables with the phrase καὶ ἔλεγεν (“and he was saying”). Likewise, in Comment to L7 we noted that the author of Mark used ὡς (“as”) in the comparison formula in the Spontaneous Growth parable as well as in his version of the Mustard Seed parable. Here we note that ὅταν (hotan, “when”) and ἐπὶ τῆς γῆς (epi tēs gēs, “upon the earth”), both of which Luke and Matthew agree against Mark to omit in L11, occur in Mark’s two other agricultural parables in his parables excursus. The conjunction ὅταν occurs once in Luke’s version of the Four Soils interpretation (Luke 8:13) and twice in Mark’s version (Mark 4:15, 16); ὅταν does not occur at all in Matthew’s version. The author of Mark used ὅταν once in Spontaneous Growth (Mark 4:29) and twice in his version of the Mustard Seed parable (Mark 4:31, 32; L11, L15). Luke’s version of the Mustard Seed parable does not included ὅταν; the author of Matthew accepted one of Mark’s instances of ὅταν in the Mustard Seed parable (Matt. 13:32; L15). Regarding ἐπὶ τῆς γῆς, this phrase occurs in Mark’s narrative introduction to the Four Soils parable (Mark 4:1), Mark’s interpretation of the Four Soils parable includes the phrase ἐπὶ τὴν γῆν τὴν καλήν (Mark 4:20), Mark’s Spontaneous Growth parable contains the phrase ἐπὶ τῆς γῆς (Mark 4:26), and in Mark’s version of the Mustard Seed parable Mark repeats ἐπὶ τῆς γῆς twice (Mark 4:31; L11, L14). Luke and Matthew agree against both instances of ἐπὶ τῆς γῆς in the Mustard Seed parable. The verb σπείρειν (speirein, “to sow”) does not occur in the Spontaneous Growth parable, but does occur twice in Mark’s version of the Four Soils parable (Mark 4:3, 4) and 6xx in Mark’s version of the interpretation of the Four Soils parable (Mark 4:14, 15 [2xx], 16, 18, 20). In the Mustard Seed parable Mark’s version has two instances of σπείρειν (Mark 4:31, 32; L11, L15); the author of Matthew accepted one of these (Matt. 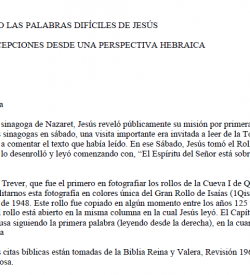 13:31 [= Mark 4:31]; L11). Luke’s version of the Mustard Seed parable does not include the verb σπείρειν. While the shared agricultural theme of the three parables in Mark’s fourth chapter makes his use of similar vocabulary in the three parables unsurprising, the Matthean and especially the Lukan parallels reveal that other, less repetitive lexical options were available. In other words, the repeated Markan vocabulary in the three parables was not merely accidental. The repeated use of these terms is the result of the author of Mark’s intentional editorial decision to change the wording of his sources to “homogenize” their vocabulary in order to emphasize the similarity of the three parables. ἔσπειρεν ἐν τῷ ἀγρῷ αὐτοῦ (Matt. 13:31). As we noted above, the author of Matthew picked up σπείρειν from Mark 4:31. Young argued that Matthew’s “in his field” reflects the wording of his non-Markan source (what we would call Anth. ), but the arguments in favor of Luke’s “in his garden” are stronger (on which, see below). Moreover, as numerous scholars have observed, two other parables in Matt. 13 take place ἐν τῷ ἀγρῷ: Darnel Among the Wheat (Matt. 13:24, 27) and Hidden Treasure (Matt. 13:44). It is therefore possible that the author of Matthew added ἐν τῷ ἀγρῷ to Matt. 13:31 in order to make a field the setting of the Mustard Seed parable as well. ἔβαλεν εἰς κῆπον αὐτοῦ (GR). Since the wording of Mark and Matthew in L11 has been shown to be redactional, we are left to consider whether the author of Luke preserved the wording of Anth. With respect to the verb and the prepositional phrase we believe that he has done so, but with respect to the possessive pronoun we suspect that the author of Luke may have written ἑαυτοῦ (heavtou, “his own”) where Anth. read αὐτοῦ (avtou, “his”). Regarding Luke’s verb, βάλλειν (ballein, “to throw”) is an odd choice from the perspective of Greek style. The author of Luke was certainly acquainted with more suitable terminology for planting, and his unusual language in L11 is best explained as his dependence on Anth. Two facts tip the balance in favor of accepting εἰς κῆπον (eis kēpon, “into a garden”) for GR. First, the term κῆπος (kēpos, “garden”) does not occur elsewhere in the Gospel of Luke or in Acts, so it is just as reasonable to suppose that the author of Luke copied κῆπος from his source as it is to assume that he supplied the noun on his own. Second, parallel to εἰς κῆπον (L11) we find εἰς ἀλεύρου (eis alevrou, “into meal”; L33) in both the Matthean and Lukan versions of the Starter Dough parable. Since the Lukan-Matthean agreement in L33 ensures that εἰς ἀλεύρου was the reading of Anth., it is highly probable that the author of Luke copied εἰς κῆπον from Anth. in L11, especially since we have found that the author of Luke has reproduced Anth.’s version of the Mustard Seed parable with a high degree of verbal fidelity. Perhaps the only change the author of Luke made to the wording of Anth. in the body of the Mustard Seed parable was to replace αὐτός (avtos, “he”) with the reflexive pronoun ἑαυτοῦ (heavtou, “himself”). Even this possible change is uncertain, since there are examples in DT pericopae where Luke and Matthew agree to write ἑαυτοῦ, and there may even be an example of a Lukan-Matthean minor agreement to use ἑαυτοῦ against Mark (Matt. 21:8 = Luke 19:36; cf. Mark 11:8), which, if genuine, would ensure that the reflexive pronoun did sometimes occur in Anth. We have also identified instances where the author of Luke likely copied ἑαυτοῦ from Anth., but where the author of Matthew was less faithful to his source (cf., e.g., Demands of Discipleship, L5, L9, L12, L18). Nevertheless, there are places where ἑαυτοῦ in Luke is probably redactional. One such example is in the Lament for Yerushalayim, where the word order of Matthew’s ὄρνις ἐπισυνάγει τὰ νοσσία αὐτῆς (“a bird gathers the chicks of her”; Matt. 23:37) is more Hebraic than Luke’s ὄρνις τὴν ἑαυτῆς νοσσιὰν (“a bird her own chicks”; Luke 13:34). If the author of Luke did replace αὐτός with ἑαυτοῦ, as we suspect, then this was a minor stylistic change that did not affect the overall meaning of the parable. Rabbinic rulings such as the one cited above have fooled many unwary scholars into assuming that Jewish law altogether prohibited the planting of mustard in gardens. Attentive reading of the rabbinic sources, however, reveals that this was not the case. According to the Mishnah (m. Kil. 3:2), mustard was not to be planted in a garden bed measuring six handbreadths square in which multiple varieties of vegetables were to be grown since such an admixture would be a violation of the prohibition against the mixing of different kinds (Lev. 19:19; Deut. 22:9). The prohibition does not apply to garden beds in which only one kind of plant is sown, nor does it apply to all types of gardens but only to garden beds of the dimensions described above. Moreover, the Tosefta reveals that the opinion articulated in m. Kil. 3:2 was not unanimous. According to Rabban Shimon ben Gamliel, it was permitted to plant mustard around the edges of a garden bed containing multiple varieties of vegetables. Thus, it is unwise to read too much into the planting of the mustard seed in a garden. Claims that the author of Luke revealed his ignorance of ancient Jewish halachah by having the man in the Mustard Seed parable plant the seed in a garden are unfounded, but rather reveal the extent of ignorance of rabbinic sources among many New Testament scholars. Even more untenable are the wild claims that by comparing the Kingdom of God to a mustard seed planted in a garden Jesus wished to convey that the Kingdom of God “is associated with uncleanness just as Jesus himself associates with the unclean, the outcast.” The most egregious example of this trend is the interpretation of the Mustard Seed parable proposed by van Eck, who claims that the parable shows the Kingdom of God to be antithetical to the “kingdom of the Temple,” since the Mustard Seed parable “tells of a kingdom where God is associated with uncleanness, where boundaries are porous, and where separation cannot and should not be maintained.” According to van Eck, the Kingdom of God subverts the kingdom of the Temple by questioning religious respectability. Such an elaborate interpretation—not only of the Mustard Seed parable but also of Jesus’ entire mission—which is founded on a misconception of ancient Jewish halachah, is unfortunate to say the least. There are no solid grounds for assuming that Jesus’ description of planting a mustard seed in a garden would have raised halachic concerns for his audience. But even if it could be proven that planting mustard in a garden was contrary to ancient Jewish practice, even then it would be unwise to attach deep theological significance to this detail, since it is not unheard of for Jewish parables to describe situations and deeds that are contrary to Jewish law, or even morally reprehensible actions and attitudes, in order to illustrate their point. Notley and Safrai cite an example in which Torah study is compared to a banquet at which meat and cheese are served, despite the fact that eating meat and cheese together is a violation of the Jewish dietary laws. Flusser cited examples of rabbinic parables in which God’s behavior is explained in terms of a callous and unpredictable slave owner. The point of such parables was not to undermine adherence to Jewish halachah or to generate distrust in God’s benevolence, but to illustrate a particular point using vivid, even shocking, imagery. The same is true of the illustrations in Jesus’ teaching. The striking images he used in his parables and similes were intended to drive home the message of the teachings to which they were attached. 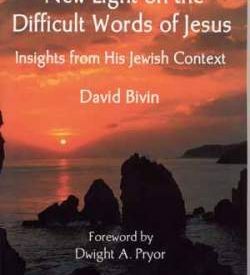 Attempts to extract subtle messages based on minor details in the parables convey a gross misconception of the nature of Jesus’ Jewish mode of instruction. Based on the above example, we have adopted בְּגִנָּתוֹ (beginātō, “in his garden”) for HR. L12-14 Mark’s inaccurate claim that the mustard seed is smaller than all other seeds on earth was picked up by the author of Matthew, but it is absent in Luke’s version and probably did not feature in the pre-synoptic versions of the Mustard Seed parable. Occasionally it is claimed that the notion that mustard seeds are the smallest of all seeds is a commonplace of Jewish folklore, but scholars who make this claim are mistaken. Ancient Jewish sources refer to a mustard seed’s bulk as a minute measure of volume (see above, Comment to L9), but they do not claim that no other seed is smaller than that of the mustard plant. The author of Mark’s exaggerated claims about the mustard seed cannot be pinned on ancient Jewish botanical ignorance. L12 ὃ μεικρότερον μέν ἐστι (Matt. 13:32). The author of Matthew smoothed Mark’s wording by adding μέν…δέ (L12, L15), changing the participle ὄν (on, “being”) into the finite verb ἐστί (esti, “it is”), and dropping Mark’s repetition of “upon the earth” in L14. Thus, the odd repetition of words and phrases in Mark’s paraphrase of the Mustard Seed parable was not without aesthetic design. L16 ἀναβαίνει (Mark 4:32). Surveys of Classical and Koine Greek sources indicate that Mark’s choice of the verb ἀναβαίνειν (anabainein, “to ascend”) to describe the growth of a mustard seed is a bit unusual, but there are examples in LXX that are comparable. We suspect that in the Four Soils parable the author of Mark used ἀναβαίνειν to describe the growth of the thorns in imitation of LXX (Mark 4:7), since there are three examples in LXX where ἀναβαίνειν is used in reference to thorns (Hos. 10:8; Isa. 5:6; 32:13). Having picked up ἀναβαίνειν + ἄκανθα from LXX usage, the author of Mark not only used this expression in the Four Soils parable to describe the growth of the thorns (ἀνέβησαν αἱ ἄκανθαι; Mark 4:7), he repeated the use of ἀναβαίνειν in the Four Soils parable to describe the growth of the seed that fell on good soil (ἀναβαίνοντα; Mark 4:8). The author of Mark then proceeded to use ἀναβαίνειν for plant growth in the Mustard Seed parable (Mark 4:32) in accordance with his “homogenization” of the vocabulary in the agricultural parables in the fourth chapter of his Gospel. αὐξηθῇ (Matt. 13:32). The author of Matthew’s procedure of blending the wording of the Markan and Anth. versions of the Mustard Seed parable means that, at best, Matthew’s wording in this pericope can only confirm Luke’s fidelity to Anth. This he has done by agreeing with Luke to use the verb αὐξάνειν (avxanein, “to grow”) to describe the mustard seed’s growth. This Lukan-Matthean agreement against Mark’s use of ἀναβαίνειν assures us that αὐξάνειν is the verb that appeared in Anth. וְצָמַח (HR). On reconstructing αὐξάνειν with צָמַח (tzāmaḥ, “sprout,” “grow”), see Yeshua’s Discourse on Worry, Comment to L32. L17 καὶ γίνεται (Mark 4:32). The author of Mark’s present tense use of γίνεσθαι (ginesthai, “to be,” “to become”) in the third person singular also bears the hallmarks of a Markan stereotype: the Gospels of Mark and Luke never agree on the use of γίνεται, and the four Lukan-Matthean agreements against Mark’s use of γίνεται (Matt. 8:24 // Luke 8:23 [cf. Mark 4:37]; Matt. 9:10 // Luke 5:29 [cf. Mark 2:15]; Matt. 13:13 // Luke 8:10 [cf. Mark 4:11]; Matt. 13:32 // Luke 13:19 [cf. Mark 4:32]) indicate that, in at least those cases, γίνεται in Mark is redactional. Moreover, three of Mark’s uses of γίνεται occur in the Markan excursus on parables (Mark 4:1-34), which suggests that the author of Mark’s use of γίνεται in the Mustard Seed parable is yet another example of his “homogenization” of the vocabulary in the three agricultural parables in the fourth chapter of his Gospel. Mustard plant near the traditional site of the Good Samaritan Inn, on the road from the Dead Sea to Jerusalem. Photographed by Todd Bolen. Image courtesy of BiblePlaces.com. μεῖζον πάντων τῶν λαχάνων (Mark 4:32). It is curious that, given his flair for exaggeration and dramatization, the author of Mark avoided describing the mustard plant as a tree (as did the authors of Luke and Matthew). Instead, he quite soberly referred to the mustard plant with the term λάχανον (lachanon, “garden herb,” “vegetable”). In any case, the author of Mark made up for his restraint in L17 by going on to describe this “garden herb” in terms of a mighty cedar of Lebanon (see below, Comment to L19-24). L18 καὶ γίνεται δένδρον (Matt. 13:32). In L18 we encounter another example of the author of Matthew’s practice of weaving together the wording of his two sources, Mark and Anth. From Mark 4:32 (L17) he took καὶ γίνεται, while from Anth. he took δένδρον, as the Lukan-Matthean agreement against Mark to use this term shows. In this way the author of Matthew was able to say both that the mustard plant grew to a size greater than the other garden herbs and that it even became a tree. Unlike narrative, where we would reconstruct καὶ ἐγένετο (kai egeneto, “and it was”) with the vav-consecutive וַיְהִי (vayehi, “and it was”), here in L18, where we are reconstructing direct speech, we have adopted a Mishnaic style of Hebrew. Such reports occur in contexts wherein the sages boast of the extraordinary fertility of the land of Israel, and should accordingly be taken with a grain of salt. Nevertheless, reports of this kind demonstrate that the hyperbole in Jesus’ parable probably would not have troubled his original audience. L19-24 It appears that in Mark 4:32 the author of Mark rewrote the ending of the Mustard Seed parable under the influence of Ezek. 17:23, much as he reworked the description of the growth of the thorns in his version of the Four Soils parable on the basis of similar descriptions in LXX (see above, Comment to L16). Wishing to retain the reference to branches, which he found in Luke’s version of the Mustard Seed parable, the author of Mark borrowed from Ezekiel the language describing the production (καὶ ποιήσει; “and it will make”) of fruit and becoming a large (μεγάλην; “big”) cedar to describe the mustard plant’s production of large branches (καὶ ποιεῖ κλάδους μεγάλους; “and it makes big branches”; L19). Likewise, instead of having the birds roost or perch in the branches, as the Lukan version of the parable describes, in homage to the Ezekiel passage the author of Mark had the birds dwell in the mustard plant’s shade (ὑπὸ τὴν σκιὰν αὐτοῦ; L21), repeating Ezekiel’s wording verbatim. It is unclear what message the author of Mark wished to convey by rewriting the ending of the Mustard Seed parable with vocabulary borrowed from Ezek. 17:23. Perhaps he did not intend to convey any message at all, but simply enjoyed retelling the stories he related in fresh language that reverberated with scriptural resonances. Or perhaps having concluded the prior Spontaneous Growth parable with an allusion to Joel 4:13, the author of Mark simply wished to conclude the Mustard Seed parable with a biblical allusion, and found in Ezek. 17:23 a convenient verse for that purpose. Unlike Mark’s version, the Lukan and Matthean versions of the Mustard Seed parable lack references to the production of large branches, indicating that these details did not belong to the parable at a pre-synoptic stage of transmission. L20 ὥστε δύνασθαι (Mark 4:32). The ὥστε + infinitive construction is a strong indicator of Markan redaction, since its use in Mark is never supported in Luke and often not supported in Matthew. ὥστε ἐλθεῖν (Matt. 13:32). From Mark the author of Matthew accepted ὥστε + infinitive, but instead of copying Mark’s verb δύνασθαι (dūnasthai, “to be able”) the author of Matthew wrote ἐλθεῖν (elthein, “to come”). It is unlikely that the author of Matthew made this change on the basis of something he read in Anth. L21 ὑπὸ τὴν σκιὰν αὐτοῦ (Mark 4:32). The absence of the verbatim quotation of Ezek. 17:23 in the Lukan and Matthean parallels shows that the quotation was added to the Mustard Seed parable by the author of Mark. L22 וְעוֹף הַשָּׁמַיִם (HR). As we noted above (Comment to L9), “to a seed of a mustard plant” and “the birds of the heaven” are the only phrases upon which all three synoptic evangelists could agree. On reconstructing τὰ πετεινὰ τοῦ οὐρανοῦ (ta peteina tou ouranou, “the birds of the heaven”) as עוֹף הַשָּׁמַיִם (‘ōf hashāmayim, “the birds of the heavens”), see Not Everyone Can Be Yeshua’s Disciple, Comment to L10. A corn bunting amid mustard flowers in southeastern Turkey. Photographed by Dûrzan Cîrano. Image courtesy of Wikimedia Commons. A few scholars, adopting an allegorical approach to the Mustard Seed parable, have argued that “the birds of the heaven” is a reference to the inclusion of the Gentiles in the new covenant. But a reference to Gentiles in the Mustard Seed parable does not fit the historical circumstances of Jesus’ lifetime, and is therefore anachronistic if Jesus is to be regarded as the originator of the Mustard Seed parable. In any case, interpreting Jesus’ parables and similes allegorically violates the purpose for which the illustrations were intended. The parables and similes describe scenarios that are analogous to the situation Jesus wished to illuminate. They are not codes to be deciphered in which every detail has a hidden significance. The description of the birds roosting in or perching on the branches simply highlights the fact of the mustard plant’s growth. Moreover, the detail is also true to life: finches and other small birds are attracted to mustard plants on account of their seeds, which the birds like to eat. L23 κατασκηνοῖν (Mark 4:32). Despite reworking the conclusion of the Mustard Seed parable in order to echo Ezek. 17:23, the author of Mark retained the verb κατασκηνοῦν (kataskēnoun, “to reside”) from Luke and/or Anth. The LXX verb in Ezek. 17:23 is ἀναπαύειν (anapavein, “to rest”). The author of Matthew followed Mark in using an infinitive form, but he added καί (kai, “and”) before the infinitive. In Mark 4:32 and Matt. 13:32 Codex Vaticanus gives the infinitive as κατασκηνοῖν (kataskēnoin), whereas the critical editions, following the majority of MSS, give the infinitive as κατασκηνοῦν (kataskēnoun). The variant readings represent two different forms the infinitive could take, but there is no difference in meaning. κατεσκήνωσεν (GR). Since Luke’s aorist form reverts more readily to Hebrew, we have accepted Luke’s reading for GR. Although κατασκηνοῦν is often translated as “to nest” in the Mustard Seed parable, since the parable does not describe the birds rearing their young in the mustard plant—the purpose for which birds build their nests—“to roost” or “to perch” or simply “to reside” are more correct translations. שָׁכְנוּ (HR). In LXX κατασκηνοῦν (kataskēnoun, “to reside”) is usually the translation of שָׁכַן (shāchan, “reside”). The LXX translators rendered שָׁכַן in a variety of ways, but the most common was with κατασκηνοῦν. In MT and in rabbinic sources the root שׁ-כ-נ is often used to describe avian behavior (roosting, flocking, etc. ), and is therefore particularly apt for reconstructing κατασκηνοῦν in the Mustard Seed parable. Compare our reconstruction of κατασκήνωσις (kataskēnōsis, “encampment”), a nominal cognate of κατασκηνοῦν, with מִשְׁכָּן (mishkān, “dwelling”), from the same root as שָׁכַן, in Not Everyone Can Be Yeshua’s Disciple, L11. L24 ἐν τοῖς κλάδοις αὐτοῦ (GR). Matthew’s description of the birds taking shelter in the branches of the mustard plant, which is unlike Mark’s portrayal of the birds resting in its shade, agrees precisely with Luke’s wording, confirming that Luke has preserved the wording of Anth. The above-cited source is another example of the yarns the sages liked to spin about the amazing fertility and productivity of the land of Israel. Nevertheless, the terminology used to describe the parts of the mustard plant is firmly rooted in reality. According to Zohary, the mustard plant has a central stem that branches toward the top. The central stalk corresponds to the term קֶלַח (qelaḥ) in the quotation above, while the בַּדִּים (badim) used to cover the potters’ shed correspond to the upper branches (usually hardly more than twigs). We have therefore chosen to reconstruct κλάδος in L24 with בַּד (bad, “twig,” “branch”). The Mustard Seed parable describes a seed that has become a thriving plant that attracts birds. Although the mustard seed’s growth is usually emphasized, the theme of transformation should not be overlooked. Not only does the seed not remain a seed, the living organism changes the environment it inhabits. We believe Jesus told the Mustard Seed parable in order to illustrate his view that the Kingdom of Heaven is not a suprahistorical static reality, but a communal activity in which God partners with human beings in order to bring redemption into the world. “Baking Bread” by Aksel Waldemar Johannessen (1920). Image courtesy of Wikimedia Commons. L25-26 ἄλλην παραβολὴν ἐλάλησεν αὐτοῖς (Matt. 13:33). On the author of Matthew’s redactional use of the formula “another parable” to introduce parables in his parables discourse, see above, Comment to L1-2. Instead of using the verb παρατιθέναι (paratithenai, “to set before”) in his introductory formula, as he had done for the Darnel Among the Wheat parable (Matt. 13:24) and the Mustard Seed parable (Matt. 13:31), here the author of Matthew used the verb λαλεῖν (lalein, “to speak”) in the introductory formula for the Starter Dough parable. Perhaps the author of Matthew was influenced to make this change by the presence of the verb λέγειν (legein, “to say”) in Anth.’s introduction to the Starter Dough parable (see below, Comment to L26). L26 καὶ πάλιν εἶπεν (GR). We have accepted Luke’s introduction to the Starter Dough parable for GR since it reverts easily to Hebrew and since some kind of brief transitional phrase between the two parables seems appropriate. L27-28 τίνι ὁμοιώσω τὴν βασιλείαν τῶν οὐρανῶν (GR). In nearly every respect the Starter Dough parable is shorter than its twin, the Mustard Seed parable. Whereas the Mustard Seed parable opens with two questions, the Starter Dough parable opens with a single question. And whereas the narrative of the Mustard Seed parable is filled out with vivid details (location, becoming a tree, birds in the branches), the Starter Dough parable is much more sparse. Greater brevity of the second illustration is characteristic of Jesus’ twin similes and parables. On the author of Luke’s tendency to replace “Kingdom of Heaven” with “Kingdom of God,” see above, Comment to L5. Despite omitting the opening question, the author of Matthew has preserved the original phrase, “Kingdom of Heaven,” in L30. לְמָה אֲדַמֶּה מַלְכוּת שָׁמַיִם (HR). On reconstructing τίνι ὁμοιώσω as לְמָה אֲדַמֶּה, see above, Comment to L6. On reconstructing ἡ βασιλεία τῶν οὐρανῶν as מַלְכוּת שָׁמַיִם, see above, Comment to L5. L29 On our omission of a Hebrew phrase corresponding to ὁμοία ἐστίν, see above, Comment to L7. L31-35 Luke and Matthew have achieved nearly complete verbal identity in the main body of the Starter Dough parable by faithfully copying the wording of their shared source, Anth. The only difference between the two versions is in L33, where Luke has the verb κρύπτειν (krūptein, “to hide”) but Matthew has ἐγκρύπτειν (enkrūptein, “to hide in”). Since in Matt. 13:33 // Luke 13:21 ζύμη refers to a leavening agent, שְׂאֹר is the clear choice for HR. A sourdough starter for leavening bread. Image courtesy of Wikimedia Commons. The type of leavening agent envisioned in Jesus’ parable is undoubtedly a sourdough starter. Prior to the development of modern processes for extracting yeast, the most common method of creating a leavening agent for bread making was to prepare and maintain a sourdough starter, which simply involved leaving a bit of dough to sit in a warm place overnight. The bacteria and yeasts that naturally occurred in the flour would cause the dough to begin to ferment. This fermented sourdough could then be added to a new batch of dough in order to cause it to rise. Although in theory every batch of dough could have been left to ferment on its own, the advantage of using a starter was that it greatly accelerated the leavening process. Kneading a pre-fermented bit of dough into the flour and water with which a person intended to bake a loaf of bread gave the entire batch a head start by introducing yeasts and bacteria uniquely suited for living in a doughy environment and especially adapted for causing dough to rise. Pliny the Elder (first century C.E.) described the use of sourdough starters in his writings (Nat. Hist. 18:26 §104). Evidently these scholars regard this general prohibition against burning leaven on the altar as an indication that leaven was impure or unholy. Jumping to the conclusion that a first-century Jewish audience would therefore have found Jesus’ comparison of the Kingdom of Heaven to leaven to be shocking or offensive, however, ignores the fact that there is no indication that first-century Jews were scandalized by the comparison of the Torah’s commandments to honey (Ps. 19:11; 119:103), even though the same verse that prohibited leaven from being offered on the altar also prohibited honey. Why, we must ask, should Jesus’ comparison of the Kingdom of Heaven to leaven be so utterly scandalous when the comparison of the Torah to honey was accepted with equanimity? Moreover, since honey was not intrinsically impure, and since honey was not regarded as a morally dubious substance despite its unsuitability for the altar, there is no good reason to make similar assumptions about leaven on the basis of Lev. 2:11. In fact, the Torah stipulated that the Two Loaves offered in the Temple during Shavuot (Pentecost) were to be leavened, as was the bread that was to accompany certain thank offerings (Lev. 7:13; m. Men. 5:1), proving that leavened products were not intrinsically impure or unholy, except during the Feast of Unleavened Bread, when both leaven and leavened substances were forbidden (Exod. 12:15, 19; 13:3, 7; Deut. 16:3-4). 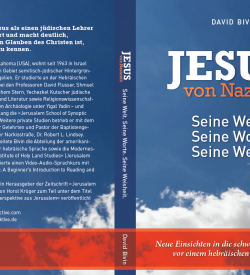 Since Jesus’ Starter Dough parable is not set during the Feast of Unleavened Bread, but simply describes a scenario from everyday life, there is no reason to assume that the comparison of the Kingdom of Heaven to a sourdough starter was intended to shock or to offend Jesus’ Jewish audience. From the above-cited examples we learn that leaven was not universally regarded as negative by ancient authors, as some scholars wrongly insist. While it is true that negative concepts, such as the evil inclination, were sometimes compared to leaven in Jewish sources, the point of comparison was not the leaven’s alleged unholiness or impurity, but its ability to completely permeate the dough into which it has been introduced (cf. 1 Cor. 5:6; Gal. 5:9). Depending on the context, a permeating influence could have either negative or positive connotations. The rabbinic comparisons of God’s causing peace to permeate the earth and of the Torah’s permeation of the soul to leaven demand a positive connotation. It should be self-evident that a parable illustrating the Kingdom of Heaven by comparing it to a sourdough starter is likewise a context that demands a positive connotation. L32 שֶׁנָּטְלָה אִשָּׁה (HR). On reconstructing the relative pronoun ὅς (hos, “who,” “which”) with -שֶׁ (she-, “who,” “which”), see above, Comment to L10. Some scholars have claimed that since Jewish culture associated women with ritual impurity the Starter Dough parable would have scandalized Jewish audiences. But since the ancient sources clearly indicate that Jewish society was not scandalized by the fact that women made bread for the household in real life, it is difficult to see how Jesus’ description of such an ordinary event in a parable could have raised an eyebrow among his original audience. It appears to us that some scholars are infatuated by the notion that the imagery Jesus used in his parables and similes was intended to shock and offend his Jewish audience. We believe it was not Jesus’ imagery but rather the messages his illustrations conveyed that were intended to challenge his audience to think about complex issues in more nuanced and creative ways. On reconstructing γυνή (gūnē, “woman,” “wife”) with אִשָּׁה (’ishāh, “woman,” “wife”), see Demands of Discipleship, Comment to L6. L33 ἔκρυψεν εἰς ἀλεύρου (GR). There is a slight disagreement between the Lukan and Matthean versions of the Starter Dough parable with respect to the form of the Greek verb for “hiding.” Whereas Luke’s version has κρύπτειν (krūptein, “to hide”), Matthew’s version has the compound verb ἐγκρύπτειν (enkrūptein, “to hide in”). Since Lukan redaction displays a preference for compound verbs, and since we have found that κρύπτειν likely occurred elsewhere in Anth., we have accepted Luke’s reading for GR. The compound verb in Matthew’s version is probably a slight stylistic improvement introduced by the author of Matthew. A fifth-century B.C.E. terracotta figurine of a woman kneading dough. Image courtesy of Wikimedia Commons. וְטָמְנָה בְּקֶמַח (HR). “Hide” is a somewhat unusual lexical selection, since “knead” or simply “put” (as in L11) would have been more obvious choices. Nevertheless, it is probably unwise to attach any great significance to the choice of verb. It simply means that the starter dough was no longer visible once the woman mixed it in with the other ingredients. On reconstructing κρύπτειν with טָמַן (ṭāman, “hide”), see Hidden Treasure and Priceless Pearl, Comment to L5. Whenever ἄλευρον (alevron, “meal,” “flour”) represents a Hebrew word in LXX, it always stands for קֶמַח (qemaḥ, “meal,” “flour”). Since ἄλευρον refers to dry meal rather than dough, neither עֲרִיסָה (‘arisāh, “dough,” “batch”) nor עִיסָה (‘isāh, “dough that has begun to rise”) nor בָּצֵק (bātzēq, “fully risen dough”) are suitable for HR. L34 שָׁלשׁ סְאִים (HR). There can be no doubt as to the wording of Anth. in L34, since Luke and Matthew both read σάτα τρία (sata tria, “three sata”), but at first glance both the word order and the vocabulary appear to resist Hebrew retroversion. Upon closer examination, however, the apparent difficulties are easily resolved. The examples we have selected involve the number three, but the same phenomenon of reversing the Hebrew word order in Greek translation occurs with other numbers as well. Given this tendency of Greek translators to reverse the Hebrew order “number→unit” to “unit→number,” we have restored the usual Hebrew word order in HR. In the above passage the prophet Haggai illustrated the disappointed expectations the returnees from exile were experiencing in the land. When they measured their stores they discovered they had less than they had initially believed. The Hebrew text is laconic, omitting what was in the pile and the unit of measure. These are supplied by the Greek translator, who guessed that the Hebrew text referred to heaps of barley and that the unit was seahs. But instead of transliterating the word סְאָה (se’āh), which the translator believed was implied by the text, he used the term σάτον (saton) derived from סָאתָא (sā’tā’), the Aramaic equivalent of סְאָה. The phenomenon of using an Aramaic-derived transliteration to represent a Hebrew term is not unique to the interface between σάτον and סְאָה. We encounter similar examples in the use of the term πασχα (pascha), derived from the Aramaic פַּסְחָא (pasḥā’), to represent פֶּסַח (pesaḥ, “Passover”) in MT, and in the use of σατανᾶς (satanas), derived from the Aramaic סָטָנָא (sāṭānā’), to represent שָׂטָן (sāṭān, “Satan”), which must have appeared in the Hebrew text of Ben Sira (Sir. 21:27). The explanation for this odd phenomenon appears to be that certain “Jewish” terms entered the Greek language via Aramaic prior to the translation of the Hebrew Scriptures into Greek. Since these Aramaic-derived transliterations were already familiar in “Jewish” Greek, it was more convenient to use these established terms when translating Hebrew sources than it was to reinvent new Hebrew-derived equivalents. It is therefore perilous to make the facile assumption that terms such as σατανᾶς, πασχα and σάτον in the Greek texts of the Synoptic Gospels are indications of an underlying Aramaic source. It is obvious that the use of σάτον in Hag. 2:16 does not point to an underlying Aramaic text, and it is highly unlikely that Josephus’ use of σάτον indicates his use of an Aramaic source in Ant. 9:71. Hence, the use of the Aramaic-derived σάτον in the Starter Dough parable does not pose a serious challenge to Lindsey’s hypothesis that the Synoptic Gospels are based on a Hebrew source. Scholars have estimated that three seahs of flour would produce enough bread to feed anywhere from one hundred to one hundred and sixty people. Some scholars have therefore concluded that three seahs of flour is an unrealistic amount intended to convey a symbolic meaning, but it is not entirely clear where the proposed estimates come from or why Jesus would want to convey a symbolic message by means of something so mundane as a unit of measure. According to the Mishnah, the average person consumed two kavs of wheat per week (m. Ket. 5:8). Six kavs make a seah, which means that three seahs were sufficient to maintain nine people for a week. Since according to ancient Jewish sources it was customary for an entire week’s supply of bread to be baked on Fridays, it is best to conclude that the Starter Dough parable describes a normal situation in which a woman made a week’s supply of bread for a large household. There are no solid grounds for assuming that the three seahs of flour in the Starter Dough parable is an exaggerated amount or that it was intended to convey mystical knowledge. Luz estimated that it would require about four pounds of starter dough to leaven a batch made from three seahs of flour. Therefore, it is not the smallness of the leaven, but its dynamism that is the focus of the parable. Just as the mustard seed changed into a tree and transformed the environment around it, so the starter dough worked into the flour changed the entire batch. In a similar way, the Kingdom of Heaven is not a static entity, but grows and expands and transforms the world, now that it has broken in upon the stage of human affairs. L35 עַד שֶׁחָמֵץ כֻּלוֹ (HR). On reconstructing ἕως (heōs, “until”) with עַד (‘ad, “until”), see Lost Sheep and Lost Coin, Comment to L22. On reconstructing ὅς (hos, “who,” “which”) with -שֶׁ (she-, “who,” “which”), see above, Comment to L10. In LXX the verb ζυμοῦσθαι (zūmousthai, “to ferment,” “to leaven”) always translates the Hebrew root ח-מ-צ. Since the active qal form חָמֵץ (ḥāmētz) was rendered with the passive form ἐζυμώθη (ezūmōthē, “it was leavened”) in Exod. 12:39 (cf. Exod. 12:34; Hos. 7:4), we feel justified in reconstructing ἐζυμώθη in L35 with חָמֵץ. On reconstructing ὅλος (holos, “all”) as כָּל (kol, “all”), see Widow’s Son in Nain, Comment to L25. While the three synoptic versions of the Mustard Seed parable tell the same overarching story, the three versions are quite dissimilar in terms of vocabulary and emphasis. These differences are mainly due to the author of Mark, who paraphrased Luke’s version of the Mustard Seed parable, and the author of Matthew’s attempt to combine the wording of the versions in Mark and Anth. The author of Luke copied the Mustard Seed and Starter Dough parables from Anth. with an exceptionally high degree of fidelity. The most significant change he made was to create a literary bridge in L3 connecting the twin parables to the Healing a Daughter of Abraham story (Luke 13:10-17). The other changes the author of Luke made to Anth.’s wording were to change “Kingdom of Heaven” to “Kingdom of God” in L5 and L28 and to change αὐτοῦ (“his”) to ἑαυτοῦ (“his own”) in L11. The Lukan versions of the Mustard Seed and Starter Dough parables revert easily to Hebrew. The author of Mark thoroughly reworked the Mustard Seed parable as he saw it in Luke and Anth. While much of Mark’s phrasing mirrors that of Luke’s version, it is a reflection as seen in a funhouse mirror rather than in a looking glass. Thus we find that, as in Luke’s version, Mark’s version of the Mustard Seed parable opens with two rhetorical questions, but the wording is quite different, and they offer considerable resistance to Hebrew retroversion (L4-6). Mark’s version adds pseudo-scientific flourishes, describing the mustard seed as the smallest of all seeds on earth (L11-14), while the mustard plant becomes greater than all other garden herbs (L17), with vast shadowy branches (L19, L21). Mark’s hyperbolic description is fantastic, but intended to echo the description of the cedar in Ezek. 17:23. The Markan version of the Mustard Seed parable has lost the narrative form of the original. There is no longer a man who plants a particular mustard seed that grows into a particular tree; in Mark we read a description of what generally happens when a mustard seed is sown in the ground. Several of the changes the author of Mark made to the Mustard Seed parable were due to his desire to homogenize the vocabulary of the agricultural parables in the fourth chapter of his Gospel. These include his use of ὡς in L7, ὅταν in L11 and L15, the verb σπείρειν in L11 and L15, ἐπὶ τῆς γῆς in L11 and L14, the verb ἀναβαίνειν in L16, and the stereotyped form γίνεται in L17. Because the author of Matthew wove together the wording of the Markan and Anth. versions of the Mustard Seed parable, there is considerable difference between Matthew’s version and Luke’s. Nevertheless, the important Lukan-Matthean minor agreements against Mark’s wording (L7, L10, L11, L16, L18, L24) are important confirmations of Luke’s fidelity to the wording of Anth. There are also places where the Matthean version of the Mustard Seed parable reflects Anth.’s wording where Luke’s version does not. These include Matthew’s use of the participle λέγων in L3, his use of the phrase “Kingdom of Heaven” rather than “Kingdom of God,” and his use of the possessive pronoun αὐτοῦ in L11, where the author of Luke wrote ἑαυτοῦ. With respect to the Starter Dough parable the situation is quite different. Aside from the introduction (“He spoke to them another parable”; L25-26), which the author of Matthew composed, and changing the opening question and answer (“To what will I compare the Kingdom of Heaven? It is like…”) into a declarative statement (“The Kingdom of Heaven is like…”; L29-30), the author of Matthew reproduced the wording of Anth. quite accurately, thereby achieving near perfect agreement with the wording of Luke’s version. The only change the author of Matthew made in the body of the Starter Dough parable was to replace Anth.’s verb κρύπτειν with the compound verb ἐγκρύπτειν in L33. 1. Was planting mustard in a garden a violation of Jewish law? The notion that Jewish law categorically forbids the planting of mustard in gardens is false. The idea sprouted up due to an inattentive and incomplete reading of ancient Jewish sources, and has unfortunately taken root in Christian scholarship and borne ugly fruit. While it is true that some sages warned against planting mustard in very small garden beds in which several different varieties were grown so as to avoid transgressing the law of diverse kinds, their opinion was not unanimous and in any case did not apply to larger gardens or to gardens in which only a single variety of plant was sown. But more importantly, the halachic regulations regarding where mustard could and could not be planted have nothing to do with the point of the Mustard Seed parable. Rabbinic parables often described scenarios that were proscribed by Jewish law or that would have been regarded as unethical or improper if put into practice in real life. There is no hint in either the rabbinic parables or in Jesus’ parables that their intention was to undermine observance of the commandments. Their purpose was simply to describe scenarios that illuminate a situation or concept that was difficult to understand. 2. Is the impurity of the Kingdom of Heaven a dominant theme in the twin Mustard Seed and Starter Dough parables, as some recent interpreters suggest? Scholars who suggest that the Mustard Seed and Starter Dough parables convey a message about the impurity of the Kingdom of Heaven have fundamentally failed to grasp the concept of ritual purity as it was understood in Second Temple Judaism. Mustard was not ritually impure, and even if someone violated the prohibition of diverse kinds, the plants were not ritually impure. This is because sin is not a cause of ritual impurity and sinners were not especially susceptible to impurity. Neither was leaven impure, and the bread that women baked weekly for their families was normally considered to be pure unless it somehow came into contact with a source of impurity. It is therefore difficult to understand why some scholars are determined to read the supposed impurity of the Kingdom into these parables. It is also difficult to understand why some scholars think the Kingdom of Heaven was associated with impurity. Jesus was known for healing people with afflictions that rendered them impure and for releasing people under the influence of impure spirits. From these actions one would more naturally associate the Kingdom of Heaven with purity rather than impurity, since when the Kingdom of Heaven manifested itself through Jesus’ acts of healing and restoration, it drove impurity out. The error seems to stem from two sources. First, the Gospels report incidents in which Jesus intentionally made himself impure, as, for example, when Jesus touched the corpse of the widow’s son in Nain. But contracting ritual impurity in the course of everyday life was not forbidden by Jewish law, and indeed it was sometimes obligatory. So the mere fact that Jesus was sometimes ritually impure is feeble grounds for associating the Kingdom of Heaven with impurity. Everyone was sometimes ritually impure. The second source of the misunderstanding is the false impression that sinners were especially impure. As we have noted, sin does not make the sinner impure: no clearer proof is needed than the fact that suspected adulteresses were made to endure the ordeal of the bitter waters in the courts of the Temple, where no impure persons were allowed to enter. If sin had made the adulteress impure, she would not have been allowed within the sacred space of the Temple. The objection among some Pharisees to Jesus’ association with sinners was not on the grounds that sinners were impure, but on the grounds that it was inappropriate to keep such bad company. Therefore, Jesus’ outreach to sinners would not have been cause for regarding the Kingdom of Heaven as impure. The Mustard Seed and Starter Dough parables compare the Kingdom of Heaven to living things that experience change and that transform their environments. Since the normal Jewish conception of the Kingdom of Heaven was of a static, suprahistorical reality, rather than a dynamic period within history when God cooperates with human beings in a mission to redeem creation, Jesus’ innovative concept required imaginative illustrations in order to be grasped by his first-century audience. The twin Mustard Seed and Starter Dough parables make a fitting conclusion to the “Yohanan the Immerser and the Kingdom of Heaven” complex in which Jesus described how the Kingdom of Heaven had begun to increase as human beings began to embrace the ways of mercy, love, peacemaking and forgiveness that characterize God’s redeeming reign over his creation. Lord of the world, who reigned before any creature was made, in the time when all things were made according to his wish, then his name was declared to be “King,” and after all things are finished he will reign alone in awe. For a discussion of the above prohibition, see Irving Mandelbaum, A History of the Mishnaic Law of Agriculture: Kilayim (Chico, Calif.: Scholars Press, 1982), 55. Apart from the Gospels, LSJ (98) cites Xenophon’s Oeconomicus 19:18 as an example of ἀναβαίνειν with reference to plants, but in that passage Xenophon describes a vine that climbs up a tree (ἄμπελος ἀναβαίνουσα μὲν ἐπὶ τὰ δένδρα). Taylor (253) cites Theophrastus, Enquiry into Plants 8:3 §2, but that, too, is an example of a bean plant climbing up a stake (ὁ δὲ δόλιχος, ἐὰν παρακαταπήξῃ τις ξύλα μακρά, ἀναβαίνει καὶ γίνεται κάρπιμος), which is equally inappropriate for describing the growth of a mustard plant. Nor does Moulton-Milligan (29-30) cite any examples of ἀναβαίνειν used to describe plant growth. From the above data we highlight these important observations: 1) The Gospels of Luke and Mark never agree on the use of γίνεται; 2) The Lukan-Matthean agreements against Mark’s use of γίνεται indicate that γίνεται in Mark is often, perhaps always, redactional; 3) The author of Matthew often rejected Mark’s use of γίνεται; 4) Except for the Passion Narrative, where Matthew uses γίνεται 2xx without the support of Mark or Luke, the author of Matthew only used γίνεται if it appeared in his source. The one exception to this rule is in Matt. 13:32; however, even in this verse the author of Matthew saw γίνεται in Mark’s parallel (Mark 4:32), albeit at a different location in the same sentence. McNeile (198) noted that Theophrastus, a classical authority on horticulture, sometimes used the term δενδρολάχανον (dendrolachanon, “tree-herb”) to describe large garden herbs. On the basis of this usage some scholars have argued that there was nothing hyperbolic in Jesus’ description of the mustard plant’s dimensions. See Kenneth W. Clark, “The Mustard Plant,” Classical Weekly 37.7 (1943): 81-83. Cf. Hunzinger, “σίναπι,” 289. But it is probably better to allow for Jesus’ use of humorous exaggeration in his parables. See Scott, Hear Then the Parable, 324-325; Witherington, Jesus the Sage, 190-192 (cf. Witherington, 269); Bovon, 2:301; van Eck, “When Kingdoms Are Kingdoms No More,” 245-246; Edwards, Luke, 400.